I noticed how social media is chock full of people posting images pertaining to the zodiac, now matter how inane or blatantly favorable/spiteful it is to particular signs. 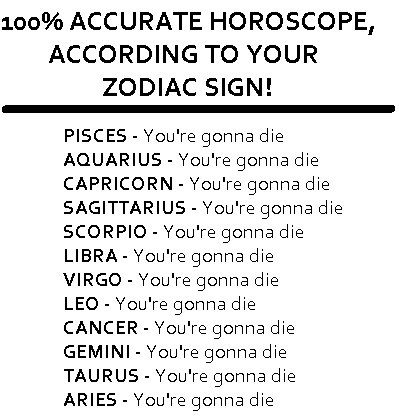 So, I made one myself, finally an honest horoscope that is 100% accurate in it's predictions, even your sign. Please like and share this image with your social media followers! cos it give me the horrors in case u are wondering why i call it a ''horrorscope'' its just a little english language joke i come up with,,,,,impressed ? I thought about making a horrorscope pun before I even opened the thread!! your mother follows her whore-oscope.